Banking Services and Mortgages in St Marys St, Shrewsbury. Address; Abbey Bank, Crown House, St Marys Street, Shrewsbury, Shropshire. SY1 1EU. In 2008, Alliance & Leicester and Bradford & Bingley become part of the Santander Group. Despite the year being a turbulent one across the whole financial industry, the acquisitions showed Santander's strength. Barclays Bank (Church Stretton); Banking and Mortgage Services in Church Stretton. Address; Barclays Bank PLC, 29 Sandford Avenue, Church Stretton, Shropshire. SY6 6BP. Barclays Bank (Oswestry); Banking and Mortgage Services in Oswestry. Address; Barclays Bank PLC, 7 The Cross, Oswestry, Shropshire. SY11 1PW. Barclays Bank (Shrewsbury); Banking and Mortgage Services in Castle Street, Shrewsbury. Address; Barclays Bank PLC, 44 to 46 Castle Street, Shrewsbury, Shropshire. SY1 2BU. Barclays Bank (Shrewsbury); Banking and Mortgage Services in Harlescott, Shrewsbury. Address; Barclays Bank PLC, Harlescott Lane, Harlescott, Shrewsbury, Shropshire. SY1 3AJ. Barclays Bank (Wem); Banking and Mortgage Services in Wem. Address; Barclays Bank PLC, 16 to 18 High Street, Wem, Shropshire. SY4 5DL. Barclays Bank (Whitchurch); Banking and Mortgage Services in Whitchurch. Address; Barclays Bank PLC, Old Town Hall, High Street, Whitchurch, Shropshire. SY13 1AP. Bradford and Bingley; Banking Services and Mortgages in High St, Shrewsbury. Address; Bradford & Bingley Building Society, 20 High Street, Shrewsbury, Shropshire, SY1 1SJ. Halifax Bank - Building Society; Bank - Building Society in Oswestry. Address; Halifax Building Society - Bank, 6 Bailey Street, Oswestry, Shropshire. SY11 1PS. Halifax Bank - Building Society; Bank - Building Society in High Street, Shrewsbury. Address; Halifax Building Society - Bank, 21 High Street, Shrewsbury, Shropshire. SY1 1SS. Halifax Bank - Building Society; Bank - Building Society in Whitchurch. Address; Halifax Building Society - Bank, 6 Green End, Whitchurch, Shropshire. SY13 1AA. HSBC Bank; Bank - Banking Services in Church Stretton. Address; HSBC Bank, 2 High Street, Church Stretton, Shropshire. SY6 6BT. HSBC Bank; Bank - Banking Services in Oswestry. Address; HSBC Bank, The Cross, Oswestry, Shropshire. SY11 2SR. HSBC Bank; Bank - Banking Services in Harlescott, Shrewsbury. 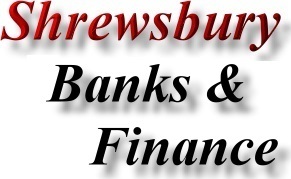 Address; HSBC Bank, Cattle Market, Harlescott Lane, Harlescott, Shrewsbury, Shropshire. SY1 3AH. HSBC Bank; Bank - Banking Services in High St, Shrewsbury. Address; HSBC Bank, 33 High Street, Shrewsbury, Shropshire. SY1 1SL. HSBC Bank; Bank - Banking Services in Whitchurch. Address; HSBC Bank, 7 High Street, Whitchurch, Shropshire. SY13 1AW. Lloyds TSB Bank; Bank - Banking Services in Church Stretton. Address; Lloyds TSB Bank, 1 High Street, Church Stretton, Shropshire. SY6 6BS. Lloyds TSB Bank; Bank - Banking Services in Oswestry. Address; Lloyds TSB Bank, 32 Church Street, Oswestry, Shropshire. SY11 2SS. Lloyds TSB Bank; Bank - Banking Services in Harlescott, Shrewsbury. Address; Lloyds TSB Bank, New Cattle Market, Harlescott Lane, Harlescott, Shrewsbury, Shropshire. SY1 3AL. Lloyds TSB Bank; Bank - Banking Services in Mount Pleasant, Shrewsbury. Address; Lloyds TSB Bank, 6 Mount Pleasant Road, Mount Pleasant, Shrewsbury, Shropshire. SY1 3BQ. Lloyds TSB Bank; Bank - Banking Services in Pride Hill, Shrewsbury. Address; Lloyds TSB Bank, 1 Pride Hill, Shrewsbury, Shropshire. SY1 1DG. Lloyds TSB Bank; Bank - Banking Services in Whitchurch. Address; Lloyds TSB Bank, 2 Watergate Street, Whitchurch, Shropshire. SY13 1DR. Nat West Bank; Bank - Banking Services in Church St, Oswestry. Address; Nat West Bank, 17 Church Street, Oswestry, Shropshire. SY11 2SX. Nat West Bank; Bank - Banking Services in Shrewsbury. Address; Nat West Bank, 8 Mardol Head, Shrewsbury, Shropshire. SY1 1HE. Nat West Bank; Bank - Banking Services in Harlescott, Shrewsbury. Address; Nat West Bank, Harlescott Lane, Harlescott, Shrewsbury. SY1 3AH. Nat West Bank; Bank - Banking Services in Wem. Address; Nat West Bank, 39 High Street, Wem, Shropshire. SY4 5DH. Nat West Bank; Bank - Banking Services in Whitchurch. Address; Nat West Bank, High Street, Whitchurch, Shropshire. SY13 1AB. Paypal; Internet Payment Facilitator (Paypal is not a Bank). HQ Address; PayPal Europe S.a.r.l. and Cie, S.C.A., 5th Floor 22-24, Boulevard Royal L-2449, Luxembourg (European HQ). Internet Payment Facilitator (Paypal UK is not a Bank). UK Address; PayPal UK Ltd, Hotham House, 1 Heron Square, Richmond upon Thames, Surrey, TW9 1EJ. Please note; We are NOT part of Paypal UK or Ebay. This section has been included in an attempt to help people who are trying to contact Paypal UK by Phone, post (mail) or email.